Drawing Room is pleased to invite Drawing Circle members to a morning of intimate studio visits in Hackney. 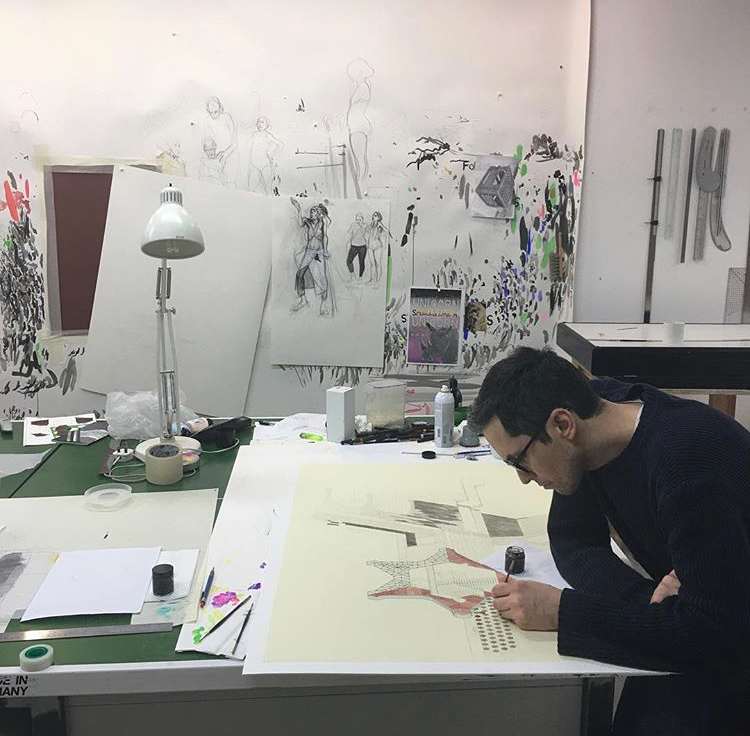 The event will start at 10.00am with a visit to Charles Avery’s studio followed by Michael Raedecker and Caroline Achaintre to see the work they are currently producing and hear about their upcoming projects. Following the event guests are invited to join Drawing Room Directors for an informal optional lunch near the studios (NB lunch at own costs). This exclusive event is free for Drawing Circle members. Drawing Network members are welcome to join for a £30 donation. Your donation will be automatically matched by the Arts Council Catalyst:Evolve fund. Donation can be paid via our DONATE page. Charles Avery (b.1973, Oban, Scotland) lives and works in London and Mull. Since 2004, Charles Avery has devoted his practice to the description of a fictional Island which he continues to elaborate, with its own population, customs and cosmology, nature and architecture, expressed in the form of large-scale drawings, sculptures, installations, texts and moving images. This ongoing body of work, created within a specific framework, is rooted in Avery’s own life and upbringing on the Isle of Mull off the West coast of Scotland. Charles was part of Drawing Biennial 2015. Recent solo exhibitions include: Solo commission, The First Art Bus in Israel, Petach Tikva Museum of Art, Tel Aviv-IS; Study #15: Charles Avery, David Roberts Art Foundation, London; Charles Avery: The People and Things of Onomatopoeia, (2017); Ingleby Gallery, Edinburgh, (2015); What's the matter with Idealism?, Gemeente Museum, The Hague, NL; Billboard for Edinburgh, Edinburgh,UK; What’s so great about Happiness? The people and things from Onomatopoeia, Grimm Gallery, Amsterdam – NL, (2014); It Means It Means! – A Drawn Exhibition by Charles Avery & Tom Morton at the Museum of Art, Pilar Corrias Gallery, London, (2013). Michael Raedecker (born Amsterdam, 1963). He studied at Gerrit Rievelt Academie Amsterdam and Goldsmiths College. He was nominated for the Turner Prize in 2000. Recent solo exhibitions include: Camouflage, Grimm Gallery, Amsterdam, 2016; Record, Galerie Max Hetzler, Berlin, Germany, (2014); Sprengel Museum, Hannover, Wilhelm Hack Museum, Ludwigshafen am Rhein, Germany, (2013). Caroline Achaintre (born Toulouse, 1969). Studied at the Chelsea School of Art & Design and Goldsmiths College, London, UK. Select solo exhibitions include Caroline Achaintre, BALTIC Centre for Contemporary Art, UK (2016); Present/Future, Illy Prize, Castello di Rivoli Museo d’Arte Contemporanea, Turin, IT (2014); Caroline Achaintre, BP Spotlight, Tate Britain, London, UK (2014); Mooner, Arcade, London, UK (2014); Camp Coo, UH Galleries and Smith Row, Hertfordshire and Bury St Edmunds, UK (2013). Her work is held in public and private collections including the Saatchi collection. Caroline was part of Drawing Biennial 2017.